The Automatic Identification System (AIS) is an automated transponder system for marine vessels, developed as a collision avoidance tool. 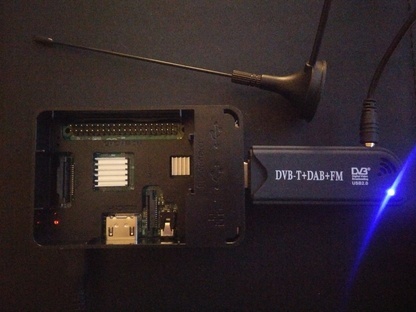 This page shows how to set up a dual-channel AIS receiver using a Raspberry Pi 3 (Model B)  and any generic RTL-SDR USB stick. We will forward the raw NMEA AIS feed via UDP to data.aishub.net from a static IP, using a DigitalOcean account. [UHF AIS signal to NMEA feed (Pi)] -> [UDP to TCP (Pi)] -> [SSH tunnel TCP (Pi) to TCP (DigitalOcean)] -> [TCP (DigitalOcean) to UDP (aishub.net)]. The SSH tunnel is kept alive by autossh, which runs as daemon in the background. You are free to choose different ports instead of the defaults 10110 and 1234 chosen here, just make sure to change the files below accordingly. We choose the Linux command line tool rtl_ais as decoder. UDP/TCP port forwarding is done by socat. Both of these programs also run as daemon processes and are automatically restarted if needed. First, set up SSH keys for your Pi to access it via WLAN/LAN from a computer in your local network without entering a password. A tutorial can be found at DigitalOcean. After you are done with this step, you are able to configure your Pi via remote console. Remove the ability to log on via password for added security. In most of the cases, you will not have a static IP address with your residential internet. Once you register the cheapest DigitalOcean.com account (currently $5/month - link with my referral code), you will have a static IP for AIS sharing purposes. Lock down your digitalocean account with two-factor authorization. Set up SSH keys and disable password access for this account, too. You can use different keys for your work computer, and the Pi accessing the account. Caveat: when you install the keys for DigitalOcean on your Pi, connect to DigitalOcean once as user pi on your Pi, and also once as root. SSH will otherwise fail to auto-connect on boot, because it will ask to add the host IP to the known_hosts file . Use git to download rtl-ais, follow the instructions on the github page, and copy the compiled rtl_ais executable to /usr/local/bin/. The output should be strings similar to !AIVDM,1,1,,A,403OwoQv2bBSDreTq0GEg6w02H;p,0*43, which is an encoded AIS message from channel A. If you are near a port and your antenna is good, you should see a few messages per minute or more. You can use ncat or socat to forward the UDP traffic to a local computer running e.g. OPENCPN to plot the ships your receiver sees on a map, and check your antenna range. Now we want to make the running system set-and-forget. We also will tunnel the UDP packets via forwarded TCP port via a persistent SSH connection to our server at DigitalOcean. The command iptraf lets you to see outgoing UDP packets. You can use ncat to quickly troubleshoot your port forwarding by sending simple text messages through the SSH tunnel. The load average on my Pi is 0.25 - there is plently of processing power left for other tasks. Log into your DigitalOcean account and install socat and iptraf. Description= forward TCP port 1234 to UDP port data.aishub.net:???? You can check the forwarding service using systemctl status tcp-udp.service -l as before. Outgoing UDP packets will show up in iptraf. That's all - your AIS receiver/forwarder system is up and running. A good starter kit, including everything you need besides the USB dongle, is this one. I recommend the slightly more expensive version by RTL-SDR.com instead of a generic cheap dongle. It has <2 ppm frequency offset which should require no frequency adjustment, a metal case, and an SMA connector for the antenna - absolutely worth the extra $10.